Jessica Strawser is the Editor-at-Large for Writers Digest magazine, where she served as editorial director for nearly a decade. Her debut novel, ALMOST MISSED YOU (St. Martin's Press), was a Barnes & Noble Best New Fiction Selection upon its March 2017 release, as well as a She Reads Book Club Selection and a PopSugar Best Spring Read. Her second, NOT THAT I COULD TELL, was a bestselling Book of the Month selection for March 2018, and is now new in paperback and available at Target stores nationwide, with a bonus Reading Group Gold guide included. 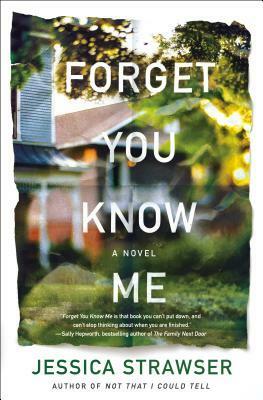 Her latest novel of domestic suspense, FORGET YOU KNOW ME, released Feb. 5, 2019, from St. Martin's Press, having been named to "Best Of" and "Most Anticipated" lists from Goodreads, PopSugar, BookBub, and elsewhere. In a starred review, Publishers Weekly calls the novel "masterful," saying, "fans of well-written suspense are in for a treat." Her diverse career in the publishing industry spans nearly two decades and includes stints in book editing, marketing and public relations, and freelance writing and editing. A Pittsburgh native and Outstanding Senior graduate of Ohio Universitys E.W. Scripps School of Journalism, she counts her New York Times Modern Love essay and her Writers Digest cover interviews with such luminaries as Alice Walker, Anne Tyler and David Sedaris among her career highlights. She lives in Cincinnati, Ohio, with her husband and two children, and has recently been named the 2019 Writer-in-Residence for the Public Library of Cincinnati and Hamilton County. A proud member of the Tall Poppy Writers and Women's Fiction Writers Association, she tweets @jessicastrawser, enjoys connecting at Facebook.com/jessicastrawserauthor, and speaks frequently at writing conferences and events that are kind enough to invite her.